he 'Great Hunger' was one of many famines in Ireland during the first half of the nineteenth century, but the size of the disaster dwarfed those that preceded it. A contemporary comment was that "God sent the blight, but the English made the famine: and to some extent this was true because the governments of both Peel and Lord John Russell did little to help the Irish population. 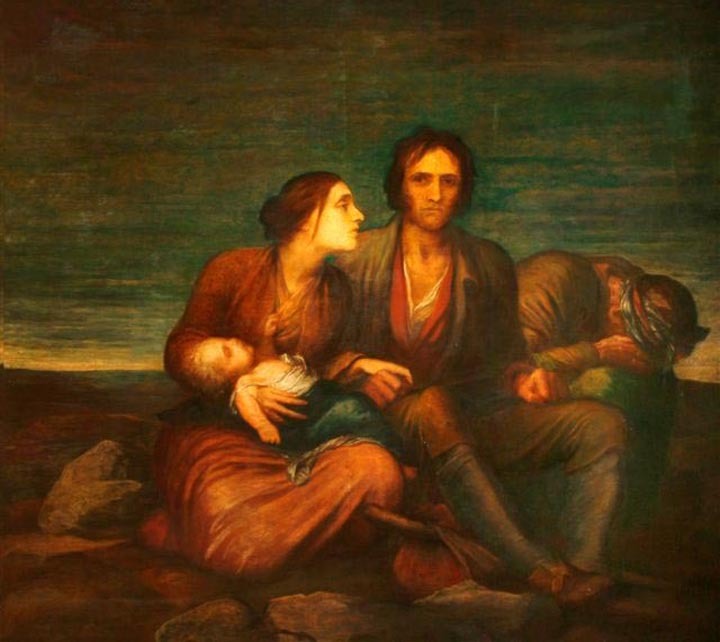 The Irish Famine. G. F. Watts. 1850. Courtesy of the Watts Gallery, Compton. Click on image to enlarge it. The Irish population had exploded in the first half of the nineteenth century, reaching about 8.5 million by 1845. The peasants were almost totally dependent on the potato as a source of food because this crop produced more food per acre than wheat and could also be sold as a source of income. Because of the widespread practise of conacre, the peasants needed to produce the biggest crop possible and so the type of potato most favoured was the "Aran Banner," a large variety. Unfortunately, this particular strain was highly susceptive to the fungus, Phytophthora infestans, commonly known as blight, which had spread from North America to Europe. The blight destroyed the potato crop of 1845 and by the early autumn of that year it was clear that famine was imminent in Ireland. Peel's government was slow to react. Peel said that the Irish had a habit of exaggerating reports of distress; since he had been Chief Secretary for Ireland between 1812 and 1818, his experience might have told him that there might have had some truth in his comment, but in 1816 he had produced a contingency plan for the government in case economic disaster ever struck Ireland. Consequently his lack of action is difficult to explain. During the winter of 1845-1846 Peel's government spent £100,000 on American maize which was sold to the destitute. The Irish called the maize 'Peel's brimstone'. Eventually the government also initiated relief schemes such as canal-building and road building to provide employment. The workers were paid at the end of the week and often men had died of starvation before their wages arrived. Even worse, many of the schemes were of little used: men filled in valleys and flattened hills just so the government could justify the cash payments. The Irish crisis was used as an excuse by Peel in order for him to the repeal the Corn Laws in 1846, but their removal brought Ireland little benefit. The major problem was not that there was no food in Ireland — there was plenty of wheat, meat and dairy produce, much of which was being exported to England — but that the Irish peasants had no money with which to buy the food. The repeal of the Corn Laws had no effect on Ireland because however cheap grain was, without money the Irish peasants could not buy it. 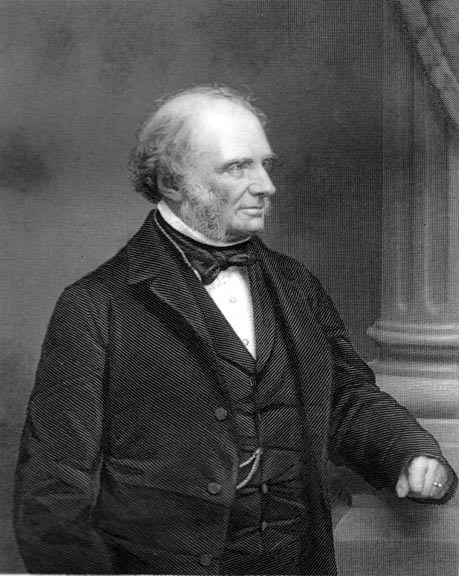 Peel was replaced in office in June 1846 by Lord John Russell and a Whig administration dedicated to a laissez-faire policy. Russell's administration believed that Irish wealth should relieve Irish poverty, and rejected the policy of direct state intervention or aid. However, neither Irish landlords nor the Poor Law unions could deal with the burden of a huge starving population. In January 1847 Russell's administration modified its non-interventionist policy and made money available on loan for relief, and soup kitchens were established. The potato crop did not fail in 1847, but the yield was low. Then, as hundreds of thousands of starving people poured into the towns and cities for relief, epidemics of typhoid fever, cholera, and dysentery broke out, and claimed more lives than starvation itself.